This is just a start. These are articles that may help with the project work we will work on during the weekend. We will add many many more as we go. Langwitches: Silvia Rosenthal Tolisano (@langwitches) has some great ideas about blogging, including how it’s not the same as analog writing, and blogging for curation. And her visual notes are amazing. Free Technology for Teachers: While often focused on tools, Richard Byrne (@rmbyrne) always makes connections to learning. 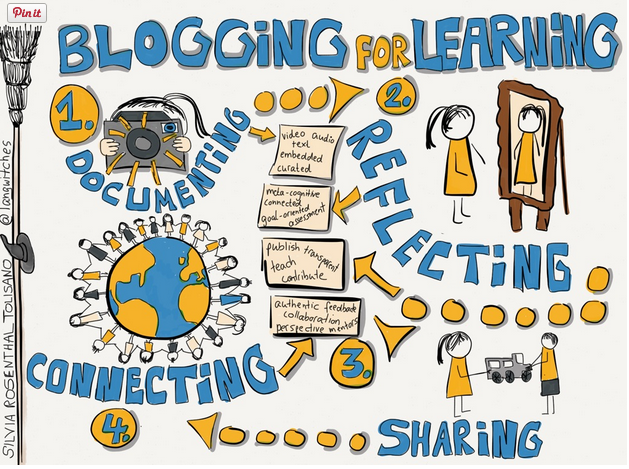 Particularly helpful are his tutorials for how to set up blogs and use blogs in the classroom. His comparison of different blogging platforms may be particularly useful for new bloggers. For people interested in global collaboration but looking for partners, Quadblogging might be one way to go. As stated on the website: “As a group of four, each week, a different class will be the focus class allowing the other three classes to visit and comment on the focus class blog”. Another possibility is Flat Connections. Click here for article about how to set up global collaboration projects and develop a classroom culture that allows for collaboration.